The stunning natural inclusions in this agate piece are reminiscent of a mystical wild landscape. Found in riverbeds at the edges of the largest volcanic basalt region in the world, the Deccan Traps in India, the famed Indian agate specimens were formed 60-80 million years ago. The specimens sold through Susan Ewington Jewellery are sourced directly from the suppliers in India and are believed to be as ethical as possible. 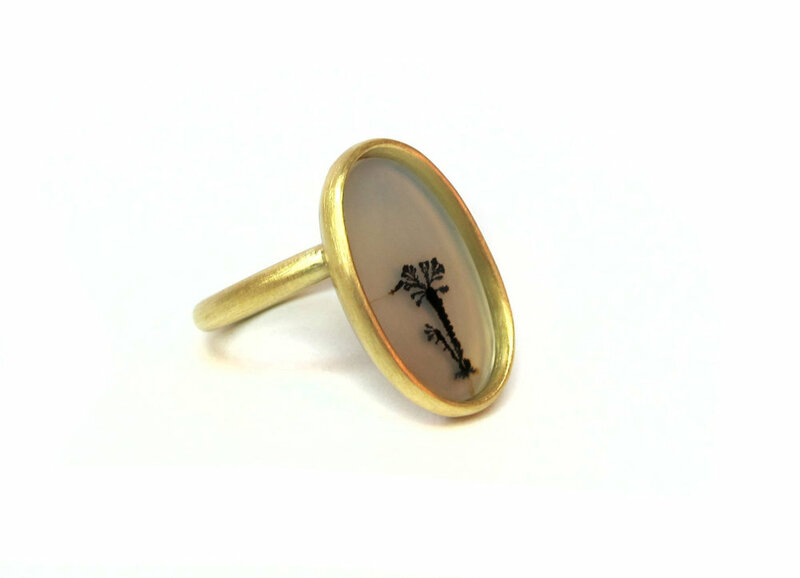 This stone would perfectly suit a classic or contemporary ring or pendant. This stone is such a statement on it's own, and speaks volumes for itself in it's intricate picturesque inclusions. The sleek elongated oval shape would lend itself perfectly to a stunning ring or a pendant. Here are some examples of rings which have used similar agate specimens. If you would be interested in seeing some design ideas for this particular stone, or see some of the other dendritic agate pieces Susan may have in stock, please feel free to get in touch.